Forest Park is a large park in suburban St. Louis, Missouri 63110. Forest Park in St. Louis, Missouri, opened in 1876 and the former site of the Louisiana Purchase Exposition of 1904, (better known as "The World's Fair") is one of the large urban landscape parks created during the later 19th century, following the example of Central Park in New York City. 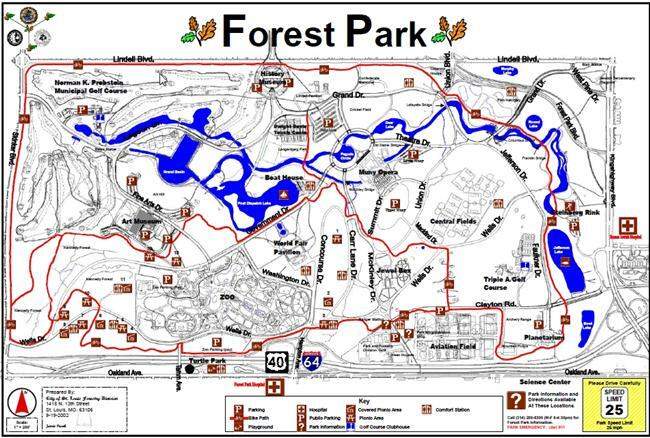 At 1,293 acres, Forest Park is over 50% larger than New York's Central Park. There are several statues and memorials that are of interest to Civil War buffs. Follow this link for a larger map image.